Last year, Colombian exports to Korea -- mainly coffee, flowers, other agricultural products, shrimp, pitahaya (or dragon fruit) and coal -- reached $457 million, while Korean exports to Colombia -- such as electronics, cars and heavy construction equipment and materials -- reached $791 million, the embassy said. On Dec. 11 in the Peruvian capital of Lima, the Korean Ministry of Foreign Affairs, Korea International Cooperation Agency and member states of the Pacific Alliance held the first Republic of Korea-Pacific Alliance Cooperation Forum, aiming to tap into new areas of mutual cooperation. Comprising Colombia, Chile, Mexico and Peru -- free trade agreement partners with Korea except Mexico -- the institution represents a rising economic bloc in Central and South America facing the Pacific Ocean and an emerging market for Korean businesses. The alliance’s commercial foreign policy includes strengthening ties with Asian economic powerhouses. 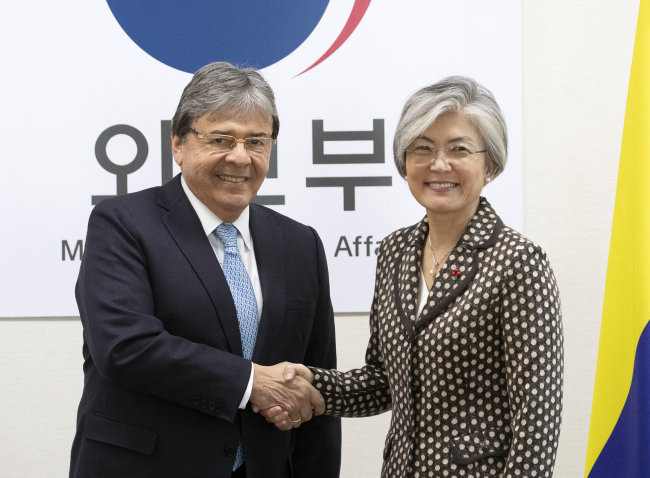 “The Korean side expressed support for Colombia’s desire to join the Asia-Pacific Economic Cooperation Forum,” the foreign minister said, adding that Bogota and Seoul -- members of the Organization for Economic Cooperation and Development -- will enhance cooperation in areas of mutual concern.